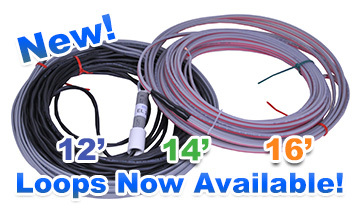 BD Loops is now offering 12ft, 14ft, and 16ft perimeter preformed loops as standard sizes. These new loops come with 20ft or 50ft of lead-in for Saw-Cut Loops, and 40ft or 60ft of lead-in for Direct Burial loops. These smaller size loops are ideal for individual lane detection or for use with barrier gates. BD Loops preformed loops are designed to save the installer up to 45 minutes per loop. Visit the BD Loops website (www.BDLoops.com) to learn how BD Loops can save you time, money, and material. BD Loops is proud to offer over 58 standard size loops ready to be shipped same day. Custom loop or lead-in sizes are available and can also be shipped same day if the order is received from a BD Loops distributor by Noon PST (3:30pm EST). For more information about our products or to find a distributor near you please visit www.BDLoops.com. BD Loops is a manufacturer of preformed direct burial and saw-cut inductance loops for the gate, door, and parking industries. With over 16 years in business the quality of BD Loops is unparalleled. BD Loops products are available through over 450 distributors in the U.S. and Canada. Visit www.BDLoops.com to find a distributor near you.